The health goodness of apple cider vinegar is no secret to the world, and its uses include cooking and medicinal purposes. Now, raw apple cider vinegar is undistilled, and its murky appearance may seem unappetizing to some of us. Therefore, many people often look for apple cider vinegar substitutes. Before we dive into the article, we want to tell you that you can reduce or buffer the acidity in apple cider vinegar by combining it with baking soda. Or, you can also opt for the clear vinegar as a substitute for apple cider vinegar instead. 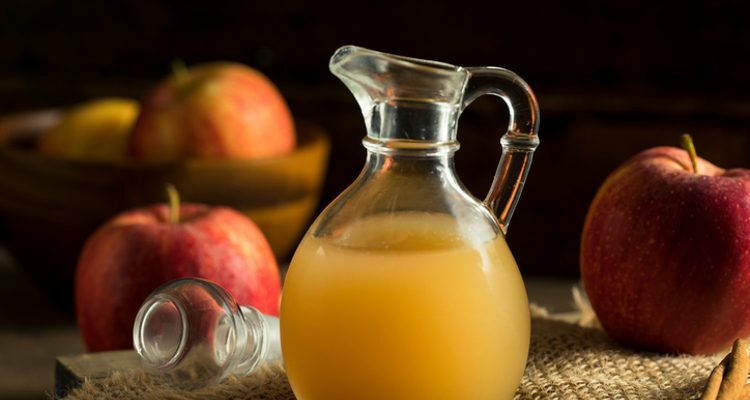 Apple cider vinegar provides some amazing health benefits based on its age-old use in traditional medicine and experiences; however, much of it lacks scientific evidence. It can be administered to treat inflammation, diabetes, gastrointestinal diseases, as well as lung and kidney infections. It also aids in weight loss. Here are eight apple cider vinegar substitutes you can try. Turmeric is an ingredient used quite extensively in Middle Eastern and Indian cuisine. In addition to imparting an attractive color and flavor to the dish, turmeric also renders its medicinal properties to it. Bring some water to boil. Then, add shreds or small pieces of raw turmeric to it. Let it cook for about five to seven minutes. Drain the water through a mesh strainer. Take one or two tablespoons of vinegar and mix it with eight ounces of the turmeric water. You can add honey if desired. Stir well and drink it on an empty stomach. This turmeric and vinegar tonic works well as a detox drink. The medicinal properties of turmeric and honey heal the body from within to prevent infection and free radical damage in the body. Ginger root is well-known for its spicy flavor and numerous medicinal and nutritional benefits. It is rich in nutrients, including vitamins B5 and B6. Heat some water in a pot. Cut some ginger root into small pieces and put them in the boiling water for five to seven minutes. Strain the water and mix it with two tablespoons of vinegar. Drink it in the morning for best results. Both clove and cinnamon bark add aroma and rich flavor to a dish. But that’s not all. Clove contains antioxidants, beta-carotene, and eugenol, a chemical compound that helps digestion by producing hydrochloric acid (HCL). Cinnamon bark is also highly rich in antioxidants and has antidiabetic, antiseptic, and anti-inflammatory properties. Crush some cloves and cinnamon bark. Then, add them to boiling water and let the mixture simmer for five to seven minutes. Strain the clove and cinnamon bark. Add one or two tablespoons of vinegar to it. Drink it daily on an empty stomach. Pomegranate juice contains polyphenols (antioxidants) like tannins and anthocyanins. It promotes blood flow and may help prevent heart disease and peripheral vascular disease. Add one or two tablespoons of vinegar to a glass of pomegranate juice. The sweet flavor and distinct aroma of the pomegranate juice go well with the vinegar. Drink this healthy tonic regularly in the morning. Passion fruit contains an extensive list of nutrients. It contains flavonoids, vitamins A and C that act as antioxidants, vitamin B in the form of riboflavin and niacin, and good amounts of fiber and protein. It also has minerals such as iron, magnesium, phosphorus, potassium, and copper. The fruit improves digestion, blood pressure, blood circulation, bone health, eye health, and helps to treat asthma and insomnia. You can easily prepare passion fruit vinegar. First, scoop out the passion fruit pulp in a bowl and mesh it properly to release the juice. Then, transfer the pulp with seeds to a glass container with vinegar and leave it to soak for at least five days. Remember to stir it once in a while. After five days, pour the fruit-infused vinegar into a heat-sterilized cheesecloth hung over a jug. Hang it for about four hours and let the liquid drip. Avoid squeezing the cloth. Add honey or sugar and boil it, stirring frequently. Store in glass jars. Barley is usually the main ingredient used to make malt extract. It is alcoholic in nature, but very nutritious. An excellent source of B vitamins, it contains thiamine, riboflavin, niacin, folate, and vitamin B6. It is also a rich source of all the amino acids. Malt beverages benefit the body in several ways. It helps regulate appetite, improves hormonal balance, promotes good vision and skin health, improves bone health, and boosts mineral metabolism. Malting involves the process of sprouting and drying a grain seed, ideally barley. It requires only two ingredients—barley seeds and water. Clean the barley seeds by soaking them in water. After a while, remove the seeds from the water, and allow them to germinate. During germination, endogenous enzymes hydrolyze α-glucans, proteins, and hemicellulose in the barley cell wall. Allow the seeds to dry completely to reduce any moisture inside them. Before milling, clean the malt to remove culms, foreign grains, and roots. Ensure the malt mill settings are graded and do not require continuous adjustment. Thyme added to vinegar boosts the nutritional value with its iron content and heart-healthy polyphenols. Also, thyme is a stimulant and has diuretic as well as antifungal properties. It is also commonly used in aromatherapy as it reduces stress and fatigue. Wash and dry some thyme sprigs. Pour the vinegar in large saucepan and place it over high heat. Add four thyme sprigs to the vinegar and boil the concoction for 10 minutes. Remove the pan from the heat and let it cool. Remove the thyme from the vinegar. Pour the vinegar into a hot, sterilized bottle and add four fresh thyme sprigs. Seal the bottle and store it in a cool place. Pine syrup is another good apple cider vinegar substitute, but it is not exactly a vinegar. It has antibacterial and anti-inflammatory properties. It may be used to treat various respiratory conditions like bronchitis, tracheitis, and asthma, as well as combat Candida. Rinse a cup of spruce or douglas fir needles. Chop them finely and place them in a pan. Add a cup of water and a cup of sugar to it. Boil it over medium heat for two to three minutes and do not stir. Remove the pan from the heat and allow the concoction to steep for two to three hours. Strain the syrup. You can store it in the refrigerator up to a month. All of these are excellent apple cider vinegar substitutes with amazing health benefits. Choose any one to reap maximum health benefits and avoid the taste of apple cider vinegar.